10 SAFE and effective strategies to get rid of dust mites naturally without using toxic sprays or chemical powders. 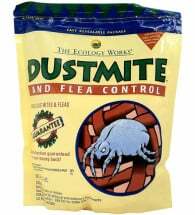 Dust mites are second only to pollen in causing allergic reactions. Asthma, eczema and allergic rhinitis are the three main allergic diseases where the cause of most attacks has been linked to them. It is not only the mite that causes the problem. The allergen which causes these allergic reactions is actually a protein found in their droppings and carcasses. Note: Recent studies suggest that at least 45 percent of young people with asthma are allergic to house mites. Unlike “seasonal” allergies caused by molds and pollen, people who are allergic to dust mites often will have symptoms year round. House dust mites are microscopic, eight legged creatures, 0.3 mm in length, and invisible to the human eye. They are arachnids, relatives of spiders, not insects. 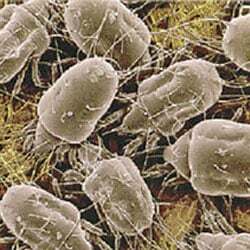 The mites are globular in shape, clear to creamy white in color, with hairs on their legs and body. Adult female mites lay 40 to 80 cream-colored elliptical eggs. After eggs hatch, they pass through six developmental stages, and the adult form may also molt once. The life cycle from egg to adult is about one month with the adult living an additional one to three months. A primary source of exposure in the home is in the bedroom, which provides the best conditions of warmth, humidity, and food for dust mite growth. Pests survive by eating dead skin cells, which make up to 80% of house dust. They also live off water vapor, which we provide for them through perspiring and breathing, approximately one pint per person per night. Select appropriate furnishings. Avoid furniture that collects dust — overstuffed furniture, fuzzy textiles. Enclose mattresses in plastic covers and replace feather pillows and down quilts with synthetic fibers. Wash bedding — pillow cases, sheets, blankets and mattress pads — every two week in hot water. Wall to wall carpet should be avoided — replace with smooth hard surfaces that are easy to clean. 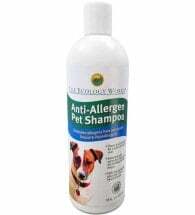 Pets with fur or feathers contribute to dander and increase the food source for mites. Vacuum mattresses and the seams and framework of beds on a regular basis. Reduce household humidity levels to below 70%. Treat with least-toxic products when necessary.